To ask other readers questions about The True Deceiver, please sign up. I like Tove Jansson’s brand of wisdom. It’s not a “hard won” wisdom of the sort that has grown from the rubble of cynicism, betrayal, and defeat. It’s a clear-eyed wisdom that has never lost its innocence; a wisdom that plays even as it sees through to the dark heart of people and things. It’s the wisdom of solitude and barrenness that attracts company and fertility but doesn’t need them; content to know but not participate overmuch, radiating a warmth from its detachment. This is a late novel by I like Tove Jansson’s brand of wisdom. It’s not a “hard won” wisdom of the sort that has grown from the rubble of cynicism, betrayal, and defeat. It’s a clear-eyed wisdom that has never lost its innocence; a wisdom that plays even as it sees through to the dark heart of people and things. It’s the wisdom of solitude and barrenness that attracts company and fertility but doesn’t need them; content to know but not participate overmuch, radiating a warmth from its detachment. This is a late novel by Jansson, published in 1982, a good decade after the last Moomin book, and is something of an oblique manifesto of this wisdom. It’s the story of two women that plays out with eerie similarities to Bergman’s Persona - two women of (initially) radically different temperaments who through close proximity push each other to crisis and change of perspective, passing through each other as this occurs, and all transpiring in a small Scandinavian house. But the agent of change in The True Deceiver is a willful action by one of the women, a possibly sociopathic, yet very beguiling and fascinating character, a calculating loner whose heart is devoted to the welfare of her simple-minded brother. She forces change upon the other woman who for a lifetime has been sheltered from the world and its vagaries by her success as an artist. It’s a cat and mouse game that proceeds with fairy tale touches (the Big Bad Wolf and the Flowery Rabbit) that only enhance its glaring realism. And once again after reading one of Tove Jansson’s “adult” novels, I am not only marveling at her narrative subtlety and evocativeness, and her effortless ability to use the natural cycles of the seasons as a plot device (this book proceeding from deep Winter freeze to the beginnings of a great Spring thaw), but also at the Finnish practice of carelessly dumping their garbage in the sea. This practice of garbage disposal plays a major role in this novel, as all the baggage of the artist character is lugged out onto the ice and piled up to await the Spring thaw when the ice will crack and all her unnecessary possessions will sink away, leaving room for her life to change even as it remains the same. Tove Jansson is probably still best known as the creator of the Moomins. Having read The Summer Book some years ago, I was already aware that she was also a talented and perceptive writer for adults. This book is deceptive - at first glance it seems like a simple tale of life in a small village in the harsh Scandinavian winter, but it gradually reveals itself to be a devastating character study as well as a reflection on the nature of creativity. It has two main characters. Katri is a somewhat s Tove Jansson is probably still best known as the creator of the Moomins. Having read The Summer Book some years ago, I was already aware that she was also a talented and perceptive writer for adults. This book is deceptive - at first glance it seems like a simple tale of life in a small village in the harsh Scandinavian winter, but it gradually reveals itself to be a devastating character study as well as a reflection on the nature of creativity. It has two main characters. Katri is a somewhat sociopathic outsider, who is responsible for a younger brother Mats who might be described in modern politically correct language as having learning difficulties. Anna is a illustrator of children's books who lives alone in a large house inherited from her parents, whose relationship with the outside world is somewhat naive and trusting. The True Deceiver would have been a good book about living with a face you can accept yourself with if it didn't tell the reader what the lies and the truths were instead of ever actually living with those lies for the reader to figure out. Do you know that scene in the 1980's film Labyrinth (a childhood favorite) when the door keepers give Sarah (Jennifer Connoly) a riddle to solve? One of them always tells the truth and the other always lies? I could never figure it out (my twin could). I have The True Deceiver would have been a good book about living with a face you can accept yourself with if it didn't tell the reader what the lies and the truths were instead of ever actually living with those lies for the reader to figure out. Do you know that scene in the 1980's film Labyrinth (a childhood favorite) when the door keepers give Sarah (Jennifer Connoly) a riddle to solve? One of them always tells the truth and the other always lies? I could never figure it out (my twin could). I have seen that movie hundreds of times. Screw the riddle. Something isn't ALWAYS true and it isn't always a lie. Not when it is about something that could change like people. Protected Anna thinks of herself as a well spring of fluffy bunnies and nice things to say. She's not. So what? Exposed Katri pats herself on the back for being brutally honest. Oh wait, she wasn't. She is honest when it suits her, same as everyone else she labels thusly. She was a liar and a thief and lived with the rabbit lady under false pretenses. It was never her right to determine if Anna was lying to herself or not. If they had known each other without those obvious universal truths (oh my god society functions with rules! ), if anything was allowed to be known other than straight up text imparted repeatedly... I pretty much agree with David's review that Katri is little more than a symbol for the author to hang her message on because of this. Katri thinks she has the right to do what she wants. Anna has done what she thinks she wants to do. I can see her sitting alone in her house and going to sleep because she's so-called above problems because she has money. I could see Katri feeling she has the under dog's so-called right to fight to the teeth because she doesn't have security. How does it feel to be them? Isn't it up to each person to decide, if they are lucky? I know what their convictions are. Katri has survivalist and Anna has this is how it is. I could have gotten that without their mouth peices telling me, too. Isn't that the only way to have faith in people? To know if they aren't just being nice to be nice? Or forgive a bad day? To live with them and read them to determine if they seem honest according to your own experience? This fairytale moral of the story didn't work for me. I would have rather watched Katri interact without the fan fare. I always knew she was lying and that it was seen by her to be her right. Guess what? She's great at maths and she recognized that the snow figure of her made by the village kids honored her maths. Great time to bring that up- the first ever! It would have been neat to determine that Katri might be wrong about everyone on my own. Her past relations with the town was a good idea but the author rolls them out too plain sight, as she does with Katri and Anna. As for the former boss she turned down not so gently? Everyone gets rejected, right? Too damned bad. I don't get to see how he suggested a relationship only that he was hurt- because I am told he is. I am told she doesn't like him instead of getting to see it. It would have been neat to determine if he really liked her before. Katri wanted her brother to love her by doing nice things for him too (buying the boat). That doesn't make her so different, I think. She wanted to be liked too! How come she comes to think it her right to bluntly expose (what she sees to be true) others in the first place? And please don't say yellow eyes and her off color hair. People get to be how they are through a life time of human interactions. Katri avoided them. Did Jansson have to just tell me she was nervous with her brother, the one person she cared for? That could have been wonderful. Because he was hers? That is a start. The book doesn't say why he is the one person she cares for and that was good. Because he is also different (simple)? Couldn't I be allowed to watch them without the this means that and people are like this? Where did she come by her insight? I know how I developed mine. I was avoiding people too and trying to stay "safe" (whatever that is). It means everything to me to read between people and pick up on how they choose to read others, what they are afraid to see and what they want to see. Jansson opened her mouth too often and just told too much. I hate that! You aren't blowing my mind by saying people lie to get along with each other. What do they want to hear and why? Did Katri want for others to live as she did and wake up to the real world? Yes, she gave books to her brother. Jansson told me that she picked these books so her brother would see the real world as she knew it. Nooooo! Mouth piece! It might be worth noting that I dislike fairy tales with easy answers. The True Deceiver reads like one. Answers and the questions already provided. It should not be that way. Katri and Anna comparing each other to learn about themselves could have been so good if they interacted without all that constant voice over of this means that. I am disappointed that she went that way because if The True Deceiver is about being honest with yourself then telling yourself things is the road to the lying to yourself, right? A German shepherd service dog growled at me in a pharmacy today. I suspect it was a fake service dog because the woman clearly didn't need one. She wasn't blind, crippled or deaf. He was ruined like Katri's dog when Anna interferes in his obedience training. Service dogs are supposed to be above common folk like me! I was bad enough to get growled at for sitting in a chair across the aisle (and to the side!). Sob why don't all dogs like me. Can't they just pretend to be nice?! Now that I mention it, the lady also fake smiled at me. This is getting ridiculous. I already assume that 99.9% of people don't really like me (the reasons vary). There are rules of polite society! Lie to me so that I will believe it. Is that too much to ask? "I can take the mail up to Miss Aemelin," she said. "I can't let you do that; it's the postman's job to deliver the mail. It's a position of trust." Katri lifted her face and opened her eyes at him; in the hard light on the porch they were truly yellow. "Trust," she said. "Don't you trust me?" She paused and then repeated, "I can take the mail up to Miss Aemelin. It's important to me." "Are you trying to help?" "You know I'm not," Katri said. "I'm doing it entirely for my own sake. Do you trust me or don't you?" Katri's question is not only to Liljeberg, but to the reader as well. The seemingly oxymoronic title begs the question: How can a deceiver be true? Katri wants to get enough money so she can have a boat built for her slow brother Mats. He has been working on the plans. Miss Aemelin is the honey pot that can make that happen. In a series of small deceptions, Katri wins Miss Aemelin's trust. But things will change. Miss Aemelin lives alone in 'the rabbit house.' It's called that because Miss Aemelin is the illustrator of books, known for the rabbits she paints on the letters of words. She seems largely unaware. Katri, blunt but good at numbers, warns her of the duplicity of neighbors. Enough of the plot, except to say, by book's end, you will wonder who the True Deceiver really is. Tove Jannson's The True Deciever is a curious, unsettling book. Katri Kling speaks the truth with unceremonious judgment. Anna Armelin illustrates children's books, focusing on the forest floor moss and adding misplaced, superfluous bunnies. Katri's stoic dog, her brother Mat, and the residents of the novel's isolated Swedish town fill out this exploration of truth, deceit, and whether or not the outliers of self-deception and blunt-force truth can be reconciled. Rarely do more than a few charac Tove Jannson's The True Deciever is a curious, unsettling book. Katri Kling speaks the truth with unceremonious judgment. Anna Armelin illustrates children's books, focusing on the forest floor moss and adding misplaced, superfluous bunnies. Katri's stoic dog, her brother Mat, and the residents of the novel's isolated Swedish town fill out this exploration of truth, deceit, and whether or not the outliers of self-deception and blunt-force truth can be reconciled. Rarely do more than a few characters interact concurrently in the course of the storyline. Jannson relies on intense personal drama in small acts; playing fetch with a dog, for example, can be an act of betrayal and subversion. Characters pass hours in isolation, considering the nuance of careful planning, impulsive behavior, and others' motivations. Jannson does a remarkable job integrating snow and winter into the storyline. The insular, almost surreal quality of walking alone through a supernaturally quiet Swedish night heightens the sense of remoteness. Both Katri and Anna believe they're doing the right thing; still, Katri's pursuit of the truth contains pinheads of duplicity, while Anna's clawing at safety and denial acknowledges the outside world's looming presence. Jannson leaves the novel and reader uncertain with the possibility of muted but spring-like growth. Do you remember that Todd Haynes movie Safe? The True Deceiver reminded me somewhat of that film. While the plots are different both allow quiet to embody its own action. This novel jarred me a bit; the characters are left raw and human, their dignity chipped, but with inherent possibility. The True Deceiver is a painstakingly constructed book that delves deeper than its length and plain language might, at first glance, indicate. Katri and Anna, the dog and the rabbit, beguile, like a dark fairy tale playing out in the plainest room. This is a perfect novel in the same way The Great Gatsby is a perfect novel. Not in the sense of "best" novel--but, in that it perfectly executes its intention, its reason to exist as a novel. Instead of a traditional protagonist-antagonist relationship there are two antagonists of equal and opposing strength at the heart of this novel. The only characteristic the two women share is the utter isolation each endures in daily life. While part of a community, they are set apart from that community, This is a perfect novel in the same way The Great Gatsby is a perfect novel. Not in the sense of "best" novel--but, in that it perfectly executes its intention, its reason to exist as a novel. Instead of a traditional protagonist-antagonist relationship there are two antagonists of equal and opposing strength at the heart of this novel. The only characteristic the two women share is the utter isolation each endures in daily life. While part of a community, they are set apart from that community, the object of speculation and hostility from others, rather than of friendship and belonging. To survive in their isolation, each of the women has developed a highly idiosyncratic way of coping with the world. The choices each makes are so mutually incomprehensible that their clash is inevitable, and when it happens, it's heartbreaking. I’ve got mixed feelings about this book. On the one hand I found it compelling to read and stayed up late to finish it, because I couldn’t put it down. I especially liked the spare style of writing; nothing was overblown. On the other hand the main characters weren’t realistic; they were sort of fairytale symbols. The theme of the book seems to be to explore how much truth/ honesty we want and whether people are actually happier with some level of kindly deception. The True Deceiver may well be a perfect book. Not a word is wasted and nothing is dumbed down: it is, in turns, complex and subtle, psychologically astute, unsettling, and controlled. The language can only be described as spare: taut, minimalistic, precise. Take the opening lines: “It was an ordinary dark winter morning, and snow was still falling. No window in the village showed a light.” In a mere two sentences, Tove Jansson sets up an entire mood and introduces a sense of danger. The two key ch The True Deceiver may well be a perfect book. Not a word is wasted and nothing is dumbed down: it is, in turns, complex and subtle, psychologically astute, unsettling, and controlled. Her opponent – and that is what she becomes – is Anna Aemalin, an illustrator of children’s books, who has achieved a degree of fame with her charming bunnies. At first meeting, she is trusting, truthful, and, like Katri, very solitary. As Katri gains her trust – and breaks down her sense of security – many themes come into play. Among them: “How many different truths are there, and what justifies them? What a person believes? What a person accomplishes? Self-deception? Is it only the result that counts?” Is it indeed safe and reassuring to believe in only one thing? And ultimately…who is the wolf and who is the rabbit? As readers, we stand by rapt as we watch the caustic and subtle effects of deception on innocence and integrity. The “prize” may be nothing less than personal identity. My hat’s off to translator Thomas Teal, who expertly and precisely translated this 1982 Finnish masterwork with all its nuances intact. [4.5] Alongside The Summer Book, this is surely the strongest of Jansson's adults' fiction works. I've connected with her grown-up books in a way I never quite did with Moomins, and this is the fifth volume I've read since joining GR. I almost didn't read The True Deceiver, assuming that it would have a sinister unreliable narrator, a type that, although it has obvious room for literary artistry, I do get tired of. Aside from the odd paragraph, The True Deceiver is actually told in third person. [4.5] Alongside The Summer Book, this is surely the strongest of Jansson's adults' fiction works. I've connected with her grown-up books in a way I never quite did with Moomins, and this is the fifth volume I've read since joining GR. I almost didn't read The True Deceiver, assuming that it would have a sinister unreliable narrator, a type that, although it has obvious room for literary artistry, I do get tired of. Aside from the odd paragraph, The True Deceiver is actually told in third person. I may not have picked it up if it hadn't won the 2011 Best Translated Book Award; it was intriguing that a prize leaning towards the experimental and highbrow had chosen a Tove Jansson novella. It's a mysterious little thing. The synopsis sounds like a contemporary domestic thriller. That is sort of the storyline, but it's also quite different. Certainly more philosophical about human character, priorities and art. The writing is very clear and spacious; it doesn't feel suffocating to the reader, although it's abundantly clear that characters may feel that way. The last few occasions I've encountered books with intentionally 'timeless' settings, I wasn't too happy: I like historical placement as atmosphere. The True Deceiver for a while I assumed to be in the 1920s or 30s, as there is only one motor vehicle in the village. Yet there are also plastic containers in the fridge. The intensity of place, indoors and outdoors, and of the shift of the seasons from winter through spring, as well as of the tight focus on a few characters, means the sense of sometime-mythical-in-the-20th-century is just fine. Thomas Teal's translations of Jansson nearly always (except, I thought, in some of the stories in A Winter Book ) don't feel like typical MFA product, they are more etheral, yet if parsed barely seem to do anything different, and I still don't understand how that works. Reading this was like staring into a deep pond of clear water: it appeared one can see quite a way in, but there's more, further in, hard to detect. I can't seem to describe it without implying there's something missing from the book that should be there, and that's not the case, but the semi-opacity felt like a conversation with the non-verbal elements not transcribed. I read this book whilst often dizzy and sometimes having splitting headaches ('splitting' being one of the most potently accurate cliches), which likely didn't help. (Also, this is a very short book which most people could read on one day unless really pushed for time; it says here it took me 6 but feels like 3). Yet the sense of mystery also comes through in reviews by others who really liked The True Deceiver. Strange, too, that it's preserved regardless of a couple of bits of very obvious symbolism: Katri Kling, owner of yellow eyes and a big dog; Anna Aemelin (different enough from her creator not to be any Mary-Sue, but still a children's illustrator lent a few aspects of Jansson's life as told in Fair Play), the painter of darling flowery bunnies. I could visualise these bunnies vividly. Whether my basis was particular ornaments I'd seen years ago, artwork, or probably both, not sure. (I have tried to search in the hope of finding some vintage item to go "Yes, that was them!" and post links, but they haven't turned up.) Cutely loaf-shaped creatures, but also very alive and moving and silently snuffling, (the accuracy of their movement seems an addition from descriptions of Aemelin's work), the flowers I see have 60s-type designs, but are also neat and compact, not overly garish. Their background fur is either white or standard rabbit-brown, it varies from scene to scene, or perhaps the rabbits could be a mixture. Katri's traits remind me of debates during the first series of Sherlock; eventually the title character announced himself to be "a high functioning sociopath", but alongside a certain cold deviousness, many viewers had also recognised Asperger's-like intelligence and social awkwardness. He defies one label, but there is something relatively unusual there in at least a couple of ways. Katri is a whizz at maths and organising; she is manipulative and good at understanding people, yet often says the wrong things, and carries an unsettling aura. She, like much of this book, can be rather unexpected. A discussion of writing letters (view spoiler)[from Anna to child fans (hide spoiler)] had a beautiful understanding of how slightly different choices of words can convey such different feeling. I do not often connect with descriptions of writing in novels this much - perhaps because it's about social letters rather than fiction. That careful choice must also go into Jansson's own writing and Teal's translation, yet one can't see the stitching anywhere, it's as if woven all of one piece. In another post earlier this month, I mentioned feeling drained by frequently identifying with characters. This book was a good balance: there were identifiable moments with both Katri and Anna, but I still felt as if I was outside them sufficiently that they were separate, different people I was watching. Satisfying; how I would like art-with-characters to work, and how, I suspect, many other people experience much of it. 2.5 stars. I really wanted to like this book. Instead, I just admired it. It is an incredibly subtle, well told story that explores abstract ideas. The slow progression of the story and the characters is so well done as to be barely noticeable, like a plant that moves imperceptibly towards the sun over several weeks. The simplicity of her style, which in her other books created a deceptive openness, creates the opposite effect here by making everything veiled, hidden, mysterious and ominous. So 2.5 stars. I really wanted to like this book. Instead, I just admired it. It is an incredibly subtle, well told story that explores abstract ideas. The slow progression of the story and the characters is so well done as to be barely noticeable, like a plant that moves imperceptibly towards the sun over several weeks. The simplicity of her style, which in her other books created a deceptive openness, creates the opposite effect here by making everything veiled, hidden, mysterious and ominous. So little is known and so little revealed that the reader is constantly wondering if he is the one being deceived (as well he should). However, I could never really fall for the book. I really disliked the Katri character. I found her to be manipulative, and her over emphasis on facts and figures to be a bear. Also, the way that she tried to change Anna was so annoying. She was pushy and wouldn’t leave her alone. Anna’s character wasn’t any better in terms of faults and flaws. She had the opposite flaws. She was overly naive. I’m sure this would’ve irked some people the way Katri irked me, but I found her pleasant at the beginning of the novel. I guess I really don’t mind overly naive people. And in fact, I found it a pity that she slowly lost her charm as Katri’s cynicism moved into her house. Although, about that last point, Katri would say that she lost her naivete a long time ago, and that now she was just lying to herself. Self deception. Perhaps. I don’t know if I buy that. One thing about Katri, though, was that she was supposed to be honest, honest to the point of being unpleasant, frowning upon social niceties. And yet she lied. She lied about her intentions when carrying out her plan to move into Anna’s house. Her whole plan was deceptive from the start. Does she really think her type of deception is better than Anna’s self deception? And at the end of the novel, when Katri said she lied about the people who she claimed had cheated on Anna, was it because she really did lie about it? Or was it because her conscience felt bad because she had made Anna distrust everybody in town? Or was it because she realized that the truth (of the objective sort) wasn’t the most important thing in the world. The changes in the characters as the novel went on were impressive in their believability and in the way they took effect in slow shifts. The characters are still who they were, but were somehow affected by the other ones. I feel like this is how people really are. They don't change entirely, the way they do in some movies and novels (with revelations! tada!) but are... contaminated. Their core being gets muddied up with what they realize they aren’t, or can’t be. They realize their shortcomings and they are sad and concede a little, but really they are still the same. Just less sure of themselves. Remember STAR TREK and the back-and-forth arguments between Spock and Captain Kirk? Spock was icy logic and objectivity; Kirk was fiery emotion and subjectivity. They were friends, but at times, you'd never know it. THE TRUE DECEIVER has a dynamic similar to that, only it's set in Sweden and casts two women as personified fire and ice. Anna Aemelin is an eccentric children's book illustrator who specializes in drawings of the forest floor and... rabbits. She lives alone in a haphazard way and is Remember STAR TREK and the back-and-forth arguments between Spock and Captain Kirk? Spock was icy logic and objectivity; Kirk was fiery emotion and subjectivity. They were friends, but at times, you'd never know it. THE TRUE DECEIVER has a dynamic similar to that, only it's set in Sweden and casts two women as personified fire and ice. Anna Aemelin is an eccentric children's book illustrator who specializes in drawings of the forest floor and... rabbits. She lives alone in a haphazard way and is easy pickings for scoundrels and cheats. Or is she? Katri Kling is good at "maths" as it is called in the book. Along with her simple-minded brother, Mats, she sweeps into the "rabbit house" (as Anna's house is called by the small-minded locals) to set things right financially and to set her own "plan" in motion. Yes, a plan is alluded to, but never identified, but this is about the only forward motion the plot offers in the way of suspense. The rest is all psychological study. Chess. Dialogue and thoughts, seemingly simple, but with a rich undertow of emotion, intrigue, and struggle between the two women. The end culminates, if you can call it that, with plot developments surrounding the minor players, Mats and the dog with no name that Katri owns and Anna commandeers. In fact, the dog becomes a symbol of sorts, and its howl is about the loudest thing you'll hear in a book smothered in snow, winter, and cool calculations. 3) Кой ни е крив, като не си казваме направо и очакваме някой друг да разгадае мислите ни. 4) Излишната любезност „защото така се прави“ (особено ми е смешно „да не се обиди домакинята“). Да изглеждаш като мълчалив темерут или да изричаш неискрено общоприети фрази. „- Приготвила съм кафе, нали ще пийнете? - Не, отказа Катри любезно, - не пия кафе. Анна се учуди, остана по-скоро изненадана, отколкото оскърбена. Та кой не пие кафе, когато го канят – това е в реда на нещата, просто от уважение към домакинята“. 6) Да казваш „не“ – трудният лукс. „- Не гледай толкова сериозно на живота. Обикновено нещата се нареждат от само себе си, стига… стига да умееш да изчакваш. 11) Зима – не е за мене тази работа, колкото и да е красива. Сигурно тези условия са родили малко по-особените характери и отношения в тази книга (и в други скандинавски). Безспорно – атмосферата се усеща идеално, още от първата страница. Разбира се хората си живеят почти нормално при тези обичайни за тях условия. „- Сестра ти чете ли нашите книги? Хладничко ми беше през цялото време. Не заради зимата. А заради отношенията „на тръни“. Тъкмо да ми хареса някой герой, и си казвам – „имай едно наум“, поддадох се и аз на съмненията. На момчето Матс ли може да се довери най-спокойно човек (подценяван и считан за безполезен и глуповат в селото)? Все пак от всичко най-ценно ми беше това, което видях и в „Пътуване с лек багаж“ и към което рисковано се стремя: освобождаване от излишно неискрено бърборене, от действането по навика „така се е правело винаги“. Пропускам и още въпроси: парите; животните, децата, самотата; имаше и интересни съседи. Нормални хора – всеки вярва, че той е правият, във всеки от нас има по нещо от тях. Но не ми се искаше да съм като някой от тримата, нито пък да съм там. Дали най-чисти остават единствено децата, животните и земята и те могат да ни служат за лакмус? this is not a peppy book. there is some small joy, and moreover, a terrible beauty in the prose, and setting. quietly dark, spare, and poetic, the true deceiver manages to be blunt and subtle, transparent and opaque, all at the same time. it's not pat, and when it ended it left me uncomfortable, and uncertain as to whether some gains were worth the loss. i was also left asking myself a lot of questions about human motivations, and about truth, and fiction, and the measurements of both; how safel this is not a peppy book. there is some small joy, and moreover, a terrible beauty in the prose, and setting. quietly dark, spare, and poetic, the true deceiver manages to be blunt and subtle, transparent and opaque, all at the same time. it's not pat, and when it ended it left me uncomfortable, and uncertain as to whether some gains were worth the loss. i was also left asking myself a lot of questions about human motivations, and about truth, and fiction, and the measurements of both; how safely removed can anyone be from other people; and about the forms we've developed in order to live alongside each other, inside our own selves. i think the novel underlines how bitterly disappointing it can be to have your perception of your own lights dimmed or changed or put away when they are slanted through someone else's eye, someone's else way of being. this is the story of two outsiders, of two polar opposites: the reviled yellow-eyed katri whose dog has no name, and whose talents for mathematics, and honest objectivity are grudgingly respected, and the reclusive anna, a privileged artist who hides in the warren of her house until the thaw with a tenuous grip on anything that isn't fiction. between them, they have only the dog, and mats, katri's younger brother. the novel begins in the harshness of winter when the daylight hours are few and one at once feels the sun-deprived stupor that lays over the little village. katri has come to realize that there is a way to fulfill her ambitions for her brother if she makes herself indispensable to the wealthy woman on the hill. "Mats would go out on a the ice with his cod hook and when no one was in sight he'd go into the boat shed. Sometimes he'd go on with his work, usually details so trivial that no one noticed they'd be done. But most times he just sat quietly in the peaceful snowlight. He never felt cold." i am in love with the word snowlight. and i may veto reading any more books with dogs in them. С всяка изчетена книга все повече се влюбвам в Туве - как умее да пише толкова пестеливо и магично за сложността на човешкото. "Честна измама" противопоставя две коренно различни жени - мечтателната и отнесена Анна и пресметливата и сурова Катри. На пръв поглед съюзници, те водят безмълвна борба за надмощие, в която залогът е опазването на собствената същност. Помагат ли тежкия характер и непоклатимите принципи на Катри да напредне в живота? Можем ли да общуваме с другите, подчинени единствено на С всяка изчетена книга все повече се влюбвам в Туве - как умее да пише толкова пестеливо и магично за сложността на човешкото. Помагат ли тежкия характер и непоклатимите принципи на Катри да напредне в живота? Можем ли да общуваме с другите, подчинени единствено на взаимно-изгодни делови взаимоотношения, без да се обвързваме с очаквания? Добродетел ли е абсолютната честност? My first thought after I completed this was, 'how do I describe this book?' I found it a bit of a struggle to pinpoint the exact plot of the book. After a first few attempts, I realized the whole point of the book was to leave the reader with very few answers and more questions. This was my introduction to Tove Jansson's books. The True Deceiver is about two women, both outcasts from the society. There's Katri Kling, who stays with her brother, Mat, above the grocery store. She is brutally honest My first thought after I completed this was, 'how do I describe this book?' I found it a bit of a struggle to pinpoint the exact plot of the book. After a first few attempts, I realized the whole point of the book was to leave the reader with very few answers and more questions. This was my introduction to Tove Jansson's books. The True Deceiver is about two women, both outcasts from the society. There's Katri Kling, who stays with her brother, Mat, above the grocery store. She is brutally honest, with no attempt to sugar-coat her words or behavior to meet the social norms. This, along with a head for Maths, makes her the go-to person for all advise seeking - regarding laws, numbers, disputes with neighbors. Yet, the very same nature, leads her to being shunned by everyone (not that she minds) and sometimes the subject of ridicule (referred to as the 'witch' by kids). The only matter of significance to Katri is securing her beloved little brother's future. Then there's Anna Aemlin, a rich, reclusive and eccentric illustrator of children's books. Like Katri, she is an outcast and a mystery to the rest of the villagers. The setting is a Finnish village in the middle of winter. The story really begins as Katri fakes a break-in into Anna's house, which convinces Anna to take Katri and her brother in, to take care of the house. The first thing that struck me was the author's description of winter. Living in Dubai, with the weather moving from very hot to hot, I could still feel the cold described in the book. It also, like all good books do, made me yearn for this Finnish village I had never heard of before. The other thing that struck me was the quietness of the book. There are no big moments, no big shockers. The silence of the book is almost disquieting because I kept on waiting for something big to happen. As the relationship between the two women develops, often fraught with tension, as each tries to control the other unsuccessfully, you are left wondering if either of them actually wins - you are not sure who is 'The True Deceiver' of the two. Another theme is that of trust and paranoia. As Katri brings comfortably oblivious Anna's attention to how the various villagers have been cheating her, we see Anna change to an increasingly distrustful person. Katri sees to loom large over Anna, taking over her personal life, arranging documents, and giving unwanted advise on finance and 'fan' letters. At first, one may see Anna as the 'victim', but is she? I picked this up because I love Moomin, and I thought that the cover was beautiful. And because, I walked into Joseph Fox Booksellers. A small bookstore where you can never buy less than four books at a time because they have such a good stock. Furthermore, you've left another twenty or so behind that you just have to have. Even better, the workers there, truly know books. You just need to know the vague sense of the plot and they can point you right to the book you want. This isn't a children's bo I picked this up because I love Moomin, and I thought that the cover was beautiful. This isn't a children's book and it is very dark. But in many ways it is about what makes people people. And how we become who we are. The deciever of the title is left up to the judgement of the reader. I know that we are suppose to see it as a quasi battle between the two women, but I have to wonder about the character of Mats. I also wonder how much of this book is based on being an outside to a small community. Karti is pretty like like the Finn witch or wise woman. Perhaps this is an inversion of Jansson herself? Despite glorious depictions of the Finnish winter and a persistent throb of human feeling that persists no matter how dark the subject matter becomes, this is something of a cruel book. I mean this in the best sense of the term, in the sense that it spares nobody in particular in telling the story of two women isolated in a small Finnish town and their various deceptions and self-deceptions. The struggle between Anna and Katri, a children's book illustrator and a mathematically gifted young woma Despite glorious depictions of the Finnish winter and a persistent throb of human feeling that persists no matter how dark the subject matter becomes, this is something of a cruel book. I mean this in the best sense of the term, in the sense that it spares nobody in particular in telling the story of two women isolated in a small Finnish town and their various deceptions and self-deceptions. The struggle between Anna and Katri, a children's book illustrator and a mathematically gifted young woman with secret plans, is both carefully drawn and resonant - Jansson constructs her scenes in such careful miniature that not a moment seems out of place: her description of a changing refrigerator, for example, and an old woman trying to slip into the kitchen in the middle of the night for a spoonful of jam, almost made me weep. It's also very funny, at times, in its dry, dark way - like an old woman wheezing in a corner over general human frailty. This is a disturbing little book on the lies we tell ourselves and the lies we tell others. This is not a happy book. There is a stark beauty in the prose and the setting. It's a story about outsiders and community, about siblings and trust. It takes place in a tiny community in the dead of winter. Katri and Mats are orphans and Katri has a plan for a better life that involves an aging, reclusive book illustrator. Lots of deception and lies happen and by the end the book really had me questioning This is a disturbing little book on the lies we tell ourselves and the lies we tell others. This is not a happy book. There is a stark beauty in the prose and the setting. It's a story about outsiders and community, about siblings and trust. It takes place in a tiny community in the dead of winter. Katri and Mats are orphans and Katri has a plan for a better life that involves an aging, reclusive book illustrator. Lots of deception and lies happen and by the end the book really had me questioning why any of us do the things we do. A short novel that is as cold and dark as a long Finnish winter. Maybe a bit too controlled and overtly symbolic, but impressive and memorable. This is an odd little book that doesn't say much while pretending to say a whole lot. Each sentence is laden with so much symbolism that when you get to the end you can't help but wonder if that was all there was to it. There's so much darkness here that it's hard for much of anything to come to light. This just wasn't a very fun book to read. I'd pick it up before bed, read the first chapter, feel myself drifting off, and put it down. The next night I'd pick it up before bed, re-read the first This is an odd little book that doesn't say much while pretending to say a whole lot. Each sentence is laden with so much symbolism that when you get to the end you can't help but wonder if that was all there was to it. There's so much darkness here that it's hard for much of anything to come to light. This just wasn't a very fun book to read. I'd pick it up before bed, read the first chapter, feel myself drifting off, and put it down. The next night I'd pick it up before bed, re-read the first chapter because surely there had been more to it than I remembered, feel myself drifting off, and put it down. There's a creeping dread present in every line that suggests that finally something is about to happen. Except that nothing ever does. It's all very interesting, in that dark Scandinavian way that makes these countries work so well as the setting for the crime novels of Jo Nesbo and shows like "The Killing", but "The True Deceiver" would function better as a painting depicting the dark, snow-swept Swedish town where the story takes place. There isn't a whole lot more to it than that. At 181 pages, it feels like this novel is either too short or too long. Will something happen or won't it? It doesn't - not really - so as a sort of Nordic fairy tale on truth and lies, it feels like it would have made a much better short story. The introduction, by Ali Smith, further proves how pointless so many introductions are. Like most, this introduction should come at the back of the book because it gives away what few key plot details there are. I re-read the introduction once I'd finished the book as well, though it failed to shed any deeper meaning on the story. I won't bother doing a recap other than to say this is about a girl whom I presumed, right up to the end, was psychotic and would eventually lash out in some violent act that would serve as a climax for this sexless thing. But no, this is a "psychological" novel, in the most impotent meaning of the word, where all the action takes place behind the character's yellow eyes and fails to make it to the page. Is the girl the witch that the townpeople's children claim? There are some haunting images in "The True Deceiver" that recalled to my mind the films of the Swedish director Ingmar Bergman. The foremost of these was a pile of Anna's belongings out on a frozen lake. This again makes me view "The True Deceiver" as a series of paintings, even if I am outraged that anyone would dispose of their garbage in such a way. 2014 is the 100th anniversary since the birth of Tove Jansson, so I'm reading more of her work in recognition of this. The True Deceiver is the story of an aging woman artist Anna Aemelin who lives alone on the outskirts of small village, snow bound as the opening pages reveal its stillness and propensity for chatter. Anna keeps to herself and is content that way, her post and necessary supplies are delivered, there is minimal disruption to her way of life and the inspiration that feeds her artis 2014 is the 100th anniversary since the birth of Tove Jansson, so I'm reading more of her work in recognition of this. Anna keeps to herself and is content that way, her post and necessary supplies are delivered, there is minimal disruption to her way of life and the inspiration that feeds her artistic leanings, which awaken with the Spring and her venturing into the woodland beyond her home. One of the villagers, Katri Krill, known to all as being good with numbers, one who can sniff out the slightest hint of corruption or exploitation, dreams of financial security for herself and her brother Mats. Despite her trustworthiness, her sudden interest in the aging artist sets tongues wagging in the village, as she takes over more and more of Anna's business affairs, bringing her out of an oblivious state of denial regarding her situation, an interference that is both appreciated and resented equally. 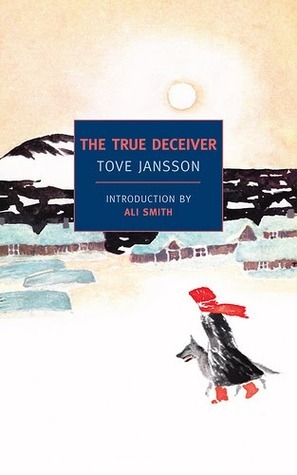 The True Deceiver is Tove Jansson at her best, struggling and yet persevering to put into story form, the battle of those two states of mind, objectivity and aesthetic sensibility, constantly at war with each other, unlikely companions just as Anna and Katri, the rabbits and the dog. Brilliantly evocative of the artistic struggle, it is a story that invites discussion and keeps the reader thinking long after that last page is turned. And wondering what those rabbits might have looked like, Moomins perhaps? A hard-edged young woman on the fringes of society decides she wants what a local children’s book illustrator (a vague, reclusive and clueless woman) has, and sets out to get it according to her own peculiar moral code. Over the course of a long Finnish winter, both characters use each other, take from each other and perhaps become a little more like each other by the end.